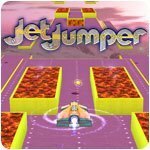 Jet Jumper - Free PC Games at Download-Free-Games.com! Do you like jumping? Jet Jumper is going to show you what extreme jumping is! Become the pilot of a fantastic jumping machine! 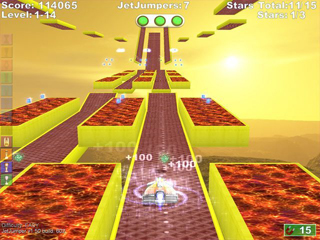 Jet Jumper is a source of blood-chilling tension. Jump from one platform to another! This may seem to be easy at first, but these platforms are placed at dizzying heights: one wrong move and you are going to fall a very, very long way. This is to say nothing of the perils you'll face; laser fences, lava platforms, bombs and more! But don't worry! There are bonuses to help you along the way. These include green keys to remove obstacles from your way, magnets that help you to collect gems, mega jumps and many more. Filled with picturesque scenery such as slopes and peaks of snowy mountains or ravines of the Grand Canyon, Jet Jumper is a feast for the eyes. 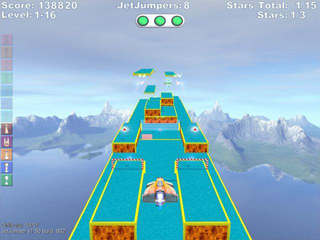 Jet Jumper is an absolutely absorbing game for all ages!